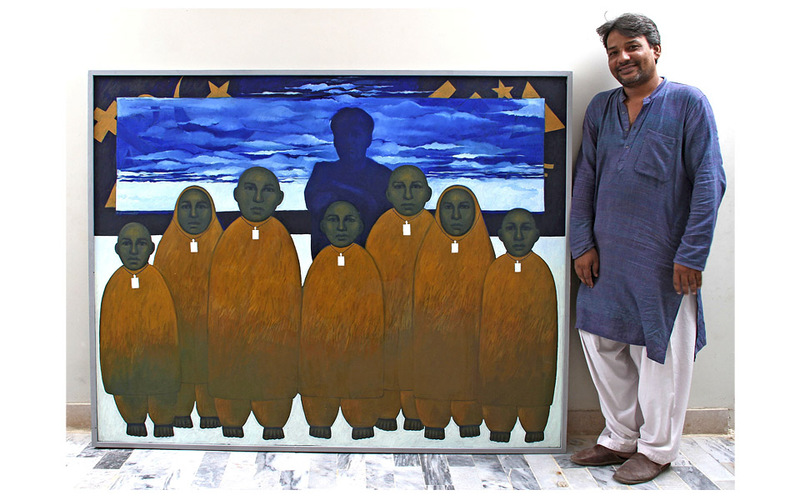 Abdul Jabbar Gull who is enjoying his participation in an International Sculpture Festival and Residency at South Korea (from 15th May to 15th June), recently exhibited his artworks at The Drawing Room, Lahore. For this show he utilized a variety of media to explore complex ideas, issues of time, movement and thought, the past and the future, the real and the imagined. Symbolism rules supreme in Gull’s artwork except for human form. Man is a reality in the universe; the rest are symbols. Man has the tendency of making symbols. He unconsciously transforms objects into symbols. This renders them great psychological importance. With human form and symbols Gull’s artworks including sculptures and paintings are an attempt to investigate complex issues linked with present day society as well as his psyche. He encounters polarity when faced with reality as opposed to theory. The theory preaches Ten Commandments where as practice negates the rules. Sufferers are the common people whom he calls ordinary souls. This is why we see ordinary faces and figures on his canvases and sculptured forms. His childhood days have a strong hold on his psyche. This past assumes the form of takhti in his art which is scribbled with text. Gull has invented a personal style of writing as a symbol of union of mankind. Mankind all over the globe cries and laughs in one single language. In emotional situations they feel the same way wherever they are placed on the globe. A very important and relevant element in Gull’s art is the presence of spirituality which is rooted deep down in his unconscious. Although he is a modern painter and sculptor, the interplay of religion and art is alive in his work. His work is significant for the use of symbols and also for being symbolic expression of the psychological condition of the modern world. There is a strange magic in his metal sculptures with birds trying to fly off the girded latticed ground. Here the bird is a symbol for the free spirit of man; the free spirit has been bounded by a lot of non-sense. The bird- the spirit, wants freedom to acquire knowledge without margins. The tied down bird also refers to nations subject to the super powers. Gull’s work is deeply rooted in his psyche, which in turn has its extraction from his past and present. He does not go far to look for ideas and vocabulary. He picks everything from his surroundings and his own personal experiences. His work is a phenomenon of our time. Gull takes upon himself the responsibility to communicate the sufferings of ordinary people to the class living in a different world. For him the main sources of inspiration are humanity, spiritual belief, politics and people, especially ordinary people. I call them `Ordinary Souls’ and I am one of them. I endeavour to express their common sufferings, grief, and relationships on individual and collective levels. Says Gull. He understands the roots of their soul, their cultural basis; as such it is difficult for him to avoid thinking about them as individuals. Exploring different religions Jabbar tries to understand spirituality and Sufism. When politically motivated, he tries to address local and global issues and the propaganda war that misleads the masses. A question I am asked occasionally is what motivates me to work? Most probably it is the urge for self expression; as a sensitive being I feel for the moral, political, and social wellbeing of the ordinary people. The outer expressions added with my inner feelings assume these forms in my artworks. Still my thoughts fly hither and thither, leading me into unknown zones, ever teasing ever intriguing. I cannot say exactly when or where I first began to realize that `art’ would become my vocation. Growing up in Mirpurkhas, a remote area in Pakistan that does not have any conventional art activities associated with larger towns, I remember seeing a sign painter on my way to school. He used to work calligraphy and make portraits. Watching him at work motivated me to attempt calligraphy and make sketches on my schoolbooks. Later, as an art student at the National College of Art, Lahore, I explored the various disciplines of art. In sculpture I found what I had been searching for all along. It helped me develop my senses and increased awareness towards the world around me. I learnt to see and feel my surroundings in an entirely new way. I found my passion. The human form for me is the most important phenomenon of the Universe. It is a major source of inspiration in my work. Additive processes like molding and subtractive processes like carving behave in different ways. I enjoy working in both mediums to reveal varied forms. A seasoned journalist, Shamim Akhter has been writing as a freelance on art and politico-social subjects for leading newspapers including Dawn, The Nation, Weekly Mag and Daily News. She also wrote for journals abroad including UK and The United States. 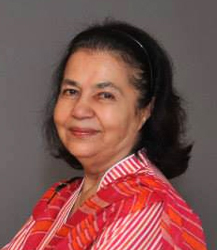 Her name is synonymous with Akhbar-e-Khawateen, the first woman’s weekly in the country, where she worked for 29 years including 22 years in the capacity of the editor of the weekly. Through this organ, she enlightened and educated women of Pakistan concerning their social rights given to them in Islam and legislation of Pakistan.